The new platform is powered by a new dataset, which takes advantage of our latest innovations in deep textual analysis, generating a 4.7x increase in the amount of events detected compared to RavenPack’s previous product. We call the new dataset: RavenPack Analytics! At a very well-attended New York event, RavenPack recently launched a new self-service data and visualization platform - allowing us to move beyond the quantitative community with our data offerings. If you missed this event, you’ll get another chance to see the new self-service data and visualization platform in action at our upcoming London Event. As part of our internal research, we recently took the new dataset for a spin - looking at one of the new key features - Event Relevance. Event Relevance provides information on the prominence of an event within a document and goes beyond our previous Relevance analytic that focused purely on the importance of a detected entity. 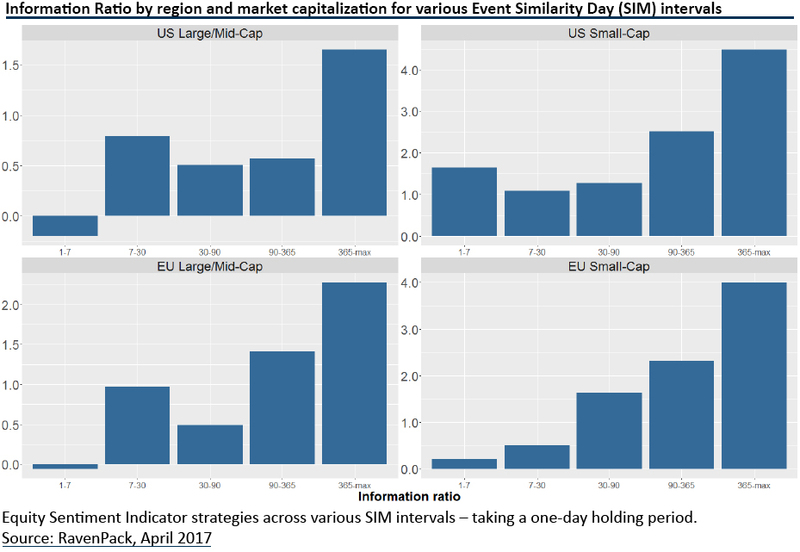 As part of our analysis, we also considered the significance of event novelty by consulting our Event Similarity Day score. As shown below, we generally find that high event relevance events (with a 90 to 100 score) significantly outperform low relevance events. However, the latter seem more predictive for small cap vs. large cap companies - possibly driven by the fact that it’s more difficult for smaller companies to make headlines or to be the focus of a news story than it is for larger companies. 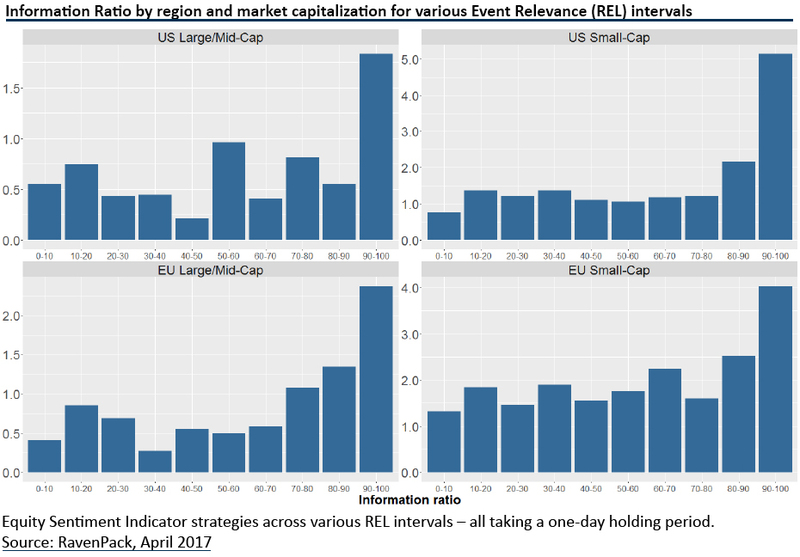 We also reconfirm that more novel events provide stronger risk-adjusted performance across our four size & region universes. However, this comes with the tradeoff of lower event volume as we filter more aggressively on the number of days required since a similar event was detected in the past (up to 365 days). The sentiment indicators are statistically significant at the 95% level across region and size, demonstrating both their robustness and ability to generate alpha. 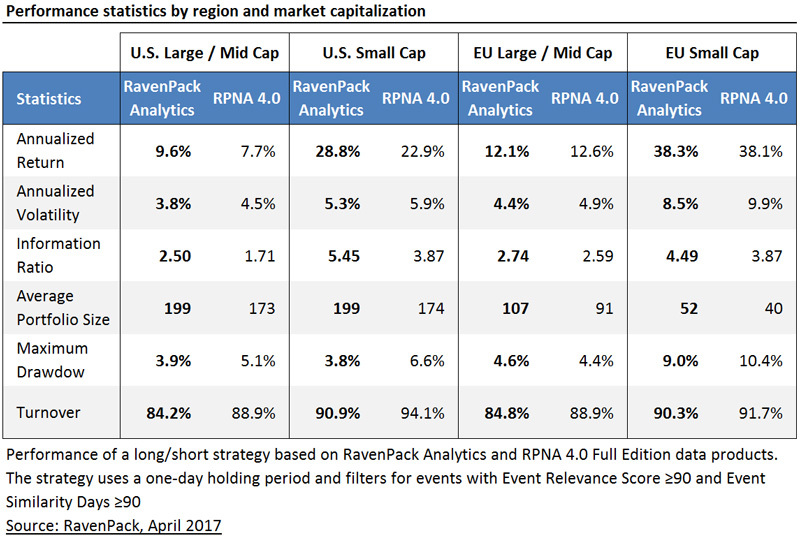 Request the full white paper titled “Introducing RavenPack Analytics for Equities” for additional details about our methodology. We test the assumption that more important events will get higher media coverage, attract the attention of investors, and result in greater price impact. Recently, RavenPack hosted its 5th Annual Research Symposium in New York titled “The Big Data & Machine Learning Revolution”. Here are my personal take-aways. In the face of an ever-increasing amount of financial news, investors need the right tools to cut through the noise to uncover the signal behind the latest move in the markets. RavenPack comes to the aid of market professionals with its state-of-the-art Natural Language Processing (NLP) solution.